Fifty years ago this month, Concorde made its first test flight in Britain. On 9 April 1969, thousands of spectators watched the delta-shaped plane soar into sky at Filton, near Bristol. Flown by the veteran RAF pilot, Brian Trubshaw, Concorde 002 was assembled by the British Aerospace Corporation in collaboration with the French company, Sud Aviation. As part of the 1962 international treaty, Britain and France jointly designed, built and tested supersonic aircraft for the commercial market. After six years of development, Concorde made a successful 22-minute flight to Fairford airfield in Gloucestershire. The normally press-shy Trubshaw concluded that the trip was ‘wizard – a cool, calm and collected operation’.1 This was despite two radio altimeters failing mid-air. After a slight bounce, he made a successful landing to the relief of nervous onlookers. Tony Benn, Labour’s minister of technology, was a committed supporter of the supersonic project, not least as his constituency was in Bristol where families relied on aerospace for their income. Deeply impressed with what he saw, he recalled the ‘beautiful bird being pulled out on the tarmac, the most advanced aircraft project anywhere in the world’. But the spectators’ joviality jarred with the nerve-wracking seriousness of the flight. Benn thought the occasion resembled more ‘a local cricket match’ than a technological breakthrough, and pondered if it ‘reflected a degree of amateurism in modern technology’ that was ‘not quite right’.2 Even if the ambience did not suit the risk involved, seeing Concorde finally get airborne was a boon for supporters of the supersonic project. Although the crowd was excited, the reaction in the media was unflattering. The New York Times dismissed Concorde as ‘an ungainly goose on the run’.3 The press was concerned with three main problems – noise, smoke and money. Under the sceptical headline, ‘Concorde: it’s been a ten-year slog’, The Economist wondered if employees had spent ‘their most effective working years building an aircraft that would be an economic disaster’.4 With a prescient conclusion, the Guardian was concerned how ‘the more emotion and inflated national pride’ were invested in the venture, the harder it would be ‘be to judge the project impartially’ if it was ultimately not a commercial success.5 A lot had happened in the seven years since the treaty in 1962, including the devaluation of sterling and the rejection of another British bid to join the Common Market. While the media harboured significant doubts, the Labour government was equally concerned. Harold Wilson’s Labour government had a troubled history with Concorde. After taking office in October 1964, it decided to withdraw from the Anglo-French treaty. Wilson sent his aviation minister, Roy Jenkins, to Paris to inform De Gaulle’s government. The French response was to withdraw all diplomatic communication with London. 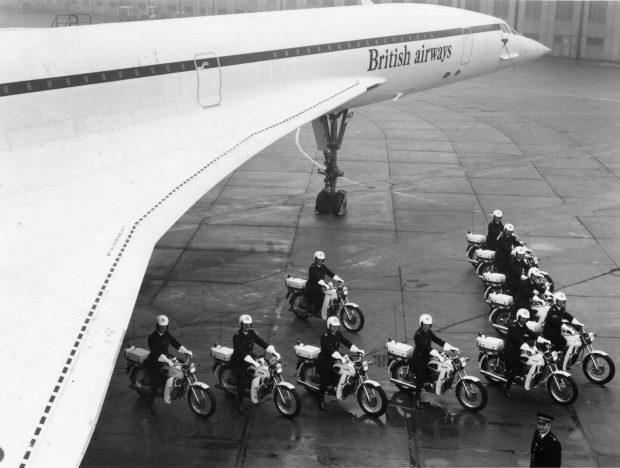 The British conceded by going ahead with Concorde, still unconvinced by its commercial prospects. Concorde’s fate was discussed at length in Cabinet the following week. The government decided to postpone any decision to withdraw, but planned to slow down the funding for research and development.8 In the aftermath of the November 1967 devaluation crisis, the Labour government sought savings wherever it could. When the Conservatives won the 1970 general election, it pursued a Eurocentric foreign policy of which Concorde was an important part. But the government failed to sell any Concordes to airlines other than British Airways and Air France. The 1973 oil crisis, combined with concerns about the ‘sonic boom’, undermined Concorde’s export potential. Commercial flights commenced in 1976 – three years behind schedule and at a cost of over £1.3 billion – a far cry from the original estimate of £70 million. Since its tragic crash at Paris in 2000 and subsequent retirement three years later, Concorde has left a contested historic legacy. Some historians have shared the same criticisms as contemporary observers in the 1960s – that it was too costly, commercially unprofitable and a political vanity symbol. Even if this is true, this has not dampened the renewed public interest in Concorde, and in the history of aviation more generally. Retired Concordes are now displayed at Bristol, Manchester and Weybridge in Surrey. Commemorative events attract large crowds and several wedding ceremonies have been celebrated inside these retired aircraft. Moreover, there has been an upsurge in interest for supersonic flight for the executive business class, the type of clientele Concorde once served. This includes the proposed Overture airliner designed by Boom Technology that has a predicted flight time from London to New York of three hours and fifteen minutes. Fifty years on, it remains to be seen if Concorde was a one-off, or the foundation for commercial supersonic travel. But even this speech provoked controversy. ln his diary, Benn recorded how he received an ‘angry letter’ from a Scotsman who complained how ‘you talk about “E” for England, but part of it is made in Scotland’. 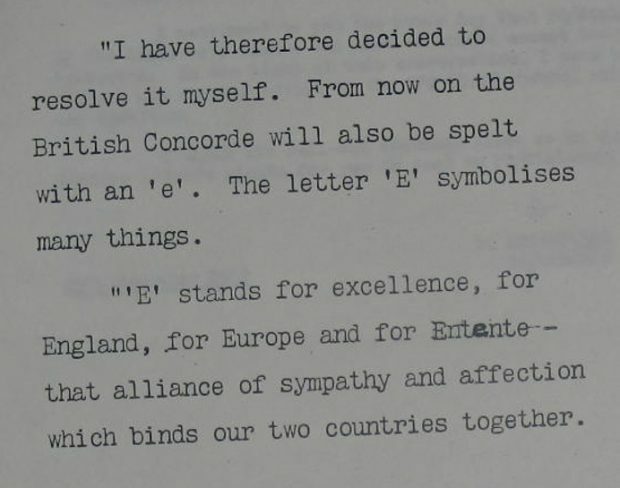 Benn deftly replied that it was also 'E' for ‘Ecossé’ (the French name for Scotland) and admitted that he could have added ‘an ‘e’ for extravagance and 'e' for escalation as well!’9 It was certainly very expensive, however, Benn remained a champion of Concorde and was on its last flight in October 2003. 4. The Economist, 12 April 1969, p.67. 7. The National Archives, CAB 129/141/2, 'Concorde: Memorandum by the Minister of Technology', 17 March 1969. 8. Conclusions of the Meeting of the Cabinet held at 10 Downing Street, SW1, on Tuesday 25 March , 1969 at 10 am', The National Archives, CAB 128/44/14. 9. Tony Benn, The Benn Diaries, 1940-1990 (London, 2005), p.175.